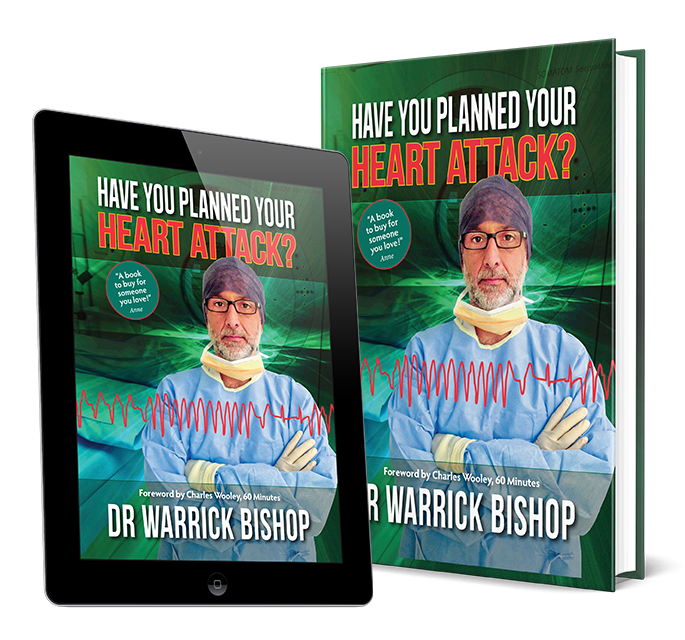 My name is Doctor Warrick Bishop and I am a Cardiologist and International Best Selling Author, who will show you the latest technology and challenge old ideas and show you how it’s possible to prevent heart attacks. Traditional risk assessment is like rolling a dice and your life is not worth the gamble. Take ownership of your health needs by knowing the information that US presidents and astronauts are already using. This book could save your life, or the life of someone close to you. As a cardiologist, I have not yet met a patient who expected to have a problem; patients do not put into their diaries “possible problem with my heart next week”. Yet, what if we could be forewarned about, or prepared for, a potential problem with our coronary arteries? … What if we could plan NOT to have heart attack? Know Your Real Risk of Heart Attack is the first-of-its-kind, offering a balanced and referenced discussion of coronary risk assessment using modern technology. This book will empower you as an individual to choose how you want to deal with your risk of the single biggest killer in the western world. What is The "Healthy Heart Network?" The Healthy Heart Network will bring together people with a desire to identify the positive steps they can take, rather than leave everything to chance. It’s for those who recognise that heart attack is a killer and want to know how they can lower their personal risk of suffering one. The Healthy Heart Network isn’t a course; it’s a journey – a journey made in company with others looking for the same information and taking the same steps to look after their heart health. It’s a place where you’ll access up-to-date information based on modern practices and proven strategies. Get Instant Access to VIP Member Area delivered weekly in easy to understand modules that require less than an hour of your time. Simply click the link and get instant access to the member area. 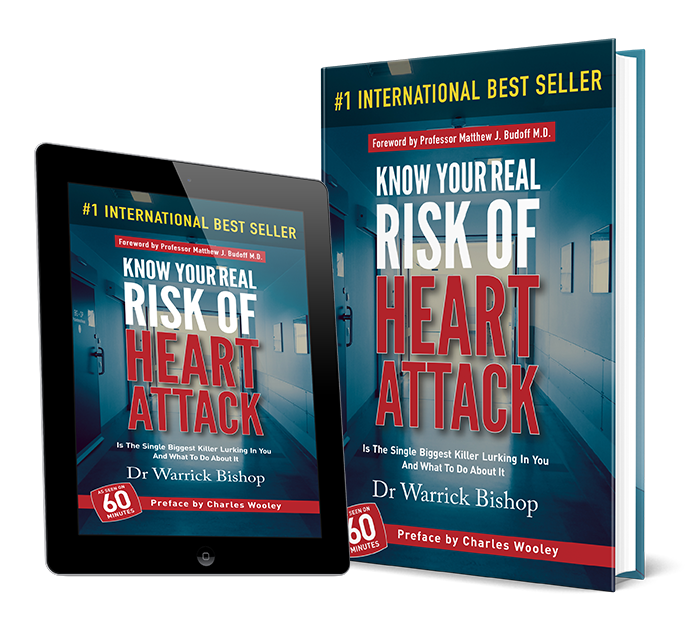 Doctor Warrick Bishop is a practising cardiologist ,best selling author and key-note speaker and who has a passion to help prevent heart disease on a global scale. A number of years ago something incredible, an amazing coincidence, happened that started Warrick on the mission to prevent heart attacks rather than try to cure them. He was driving to work one day when he stopped at a commotion by the side of the road. A fun runner had collapsed during a fun run with a heart attack. He helped in his resuscitation only to find out that had seen the very same man two years earlier and reassured him that he was fine. Warrick had missed the chance to make a difference and it nearly cost a life!! . Based on risk calculation and the best practice of the time, he shouldn’t have been at high risk…..but he was! That meant that he had reassured a patient based on treadmill testing, the best care available at the time that he was fine, only to be part of the team that resuscitated that man when he dropped dead during a running race, this was just not good enough, and he asked himself could this be done differently? This important question started him on a journey which meant he was open to looking more closely at new and emerging technology to help in being more precise about risk of heart attack. It became clear to Warrick the more precise we can be in the information we have in regard to a patients heart health and real risk of heart attack, the better we can look after that person, it seems so obvious when you say it like that, but that opportunity is still only new and not broadly utilised in the medical community.